Since the beginning of the 19th century, the Braille system has revolutionized written communication for the visually impaired. First called "night writing", it was originally invented by soldiers in order to communicate silently at night. When it comes to using braille in our everyday lives, many of us remain in the dark, but these elegant cups shed light on this sophisticated communication system while heightening senses as you share drinks with friends. 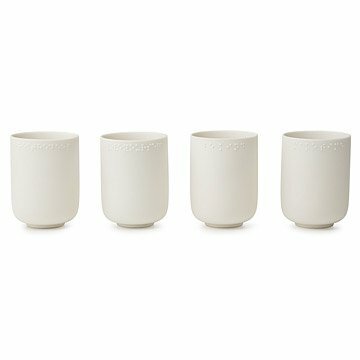 Designer Liv Andersson looks to her Scandinavian heritage for inspiration, and her preference for a minimal, modern aesthetic comes through in this set of four, creamy porcelain cups. The raised braille lining the lip of each cup spells out one of four lines: "Be Kind," "Breathe Deep," "Love Yourself," and "Make Time" (phrases are also printed on the bottom of each cup). Each meditative phrase takes on a whole new meaning as the message grazes your lips with every sip. Made in China. Swedish design has become iconic for its elegant simplicity and thoughtful functionality, so it's no surprise that designer Liv Andersson hails from that Scandinavian nation. Her work seems pared back, revealing the core, inner essence of a thing, yet it also remains somehow full of delightfully surprising details. She seeks to use as few materials in production as possible, and in 2009 received a "Green Furniture Award". She received her training at both the Lund School of Design, in Sweden, and at Universite deMontreal, in Canada. 3" dia. x 4" H; capacity: 8 oz. Please note, this item is discontinued. When it sells out, it will no longer be available. This is absolutely adorable. As a Certified Vision Rehabilitation Therapist, I am always looking for Braille novelty items. From what I can see in the picture, they forgot to put spaces between the words, however. Otherwise, I would have purchased them on the spot. Can't wait to buy these cups! I'm a teacher of the blind & visually impaired...can't wait to take these mugs to work & share them with my Vision Staff!! Elegant cups with braille phrases heighten senses as you share drinks with friends.